My word for 2011 was Possible, but somehow it turned more into Adventure. I think this was because I put the tagline “Live Adventurously” into my blog header and from then on it stuck. I wrote a little about that on Messy Canvas in the comments, how adventure butted in and took over. I’m not too disappointed that Possible was moved out of the way, but I think both words tend to go hand in hand. Frankly, I thought about making Adventure my word for next year but decided against it since it seemed to take over this year. Instead the first word after that was Productive. The more I thought about that word the more sterile and bland it became. Productive feels like something that someone at Dunder Mifflin might say. I looked up synonyms and came up with Prolific. 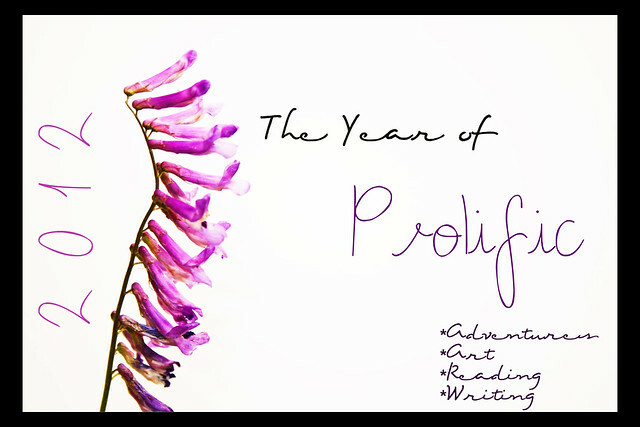 I want to be prolific in 2012. Part of being prolific has also been ‘focus’, in that I need to specialize in something in each of these categories (except for reading…I just want to read more). With being prolific and focusing on a particular subject in these arenas, Art, Adventure, and Writing, I want to be really darn good at what I do. I am meshing together photography and drawing. In both of these I want to work on a series of work, several in fact, and on the art side I have a few that are AT related. I hope that at the end of the year I would have enough within the series to do something with it, either publishing it in a magazine or having a show or just selling it or making prints somehow. I’ll conquer that when that time goes. Need to do the work first! On the photography side I want to do a series as well, but also start focusing more on the macro side of things since that is where I tend to take most of my photographs. I also like doing landscapes but Chris is much better at that than I am, and I think has the patience to seek out those landscapes. I want to do smaller scenes, either smaller, more compact landscapes but also the tiny macro scenes and shots that get missed. I also want to submit my work to magazines and gallery exhibitions! I have two exhibitions in mind already. Also in photography I am trying to get this portrait thing off the ground and would certainly like to have at least one client a month! Again, I think it is time to specialize in something instead of being so broad and I am thinking of settling on maternity and children. I have no desire for weddings or other big parties. Since our days of big backpacking adventures are over for now, we’ll be doing smaller backpacking and car camping trips, but I also want to do other adventures that might be overlooked locally. Our friend Speaker just finished the Source to Sea of the Mississippi River and Chris and I joked that we could do the Source to Sea of the San Jacinto River—in about the length of a long weekend. Of course the river might be dry in some spots due to the drought, so theorhetically we could probably walk the length of the river right now. That’s just one thing—doing smaller adventures and being prolific about it. The basic premise is to get out, see and do. For years I’ve wanted to write a book but the actual premise never really came to me. I contemplated an AT book (I actually have an idea for one but it doesn’t involve thru-hiking and would take a load of research and interviews…) but realized the market was inundated with thru-hiking memoirs. Instead I am working on a book on our Florida Trail hike. Yes, this is even more specialized and I doubt I will sell enough for me to stop working (I can dream!) but more needs to be written about the Florida Trail. I am hoping to transfer this also to writing articles in various magazines about the FT but also to expand my writing and write about places we visit in Texas too. That and I want to guest blog on a few blogs that I follow…I just want to write! Hopefully at the end of the year I have a book written and some articles, too. Being prolific is going to require focus and execution of the goals so I will probably be pulling back from blogging some, only writing here a few times a week instead of almost every day…unless I have the time to write posts for a week to schedule, which is what I do sometimes. I will be around but when I catch myself heading for Pinterest, I will know that I am just wasting time and should be doing something else! What is your word for the year? Need ideas on what to do with your word? Mandy has some great ones! 2012—-we’re going to be Prolific! 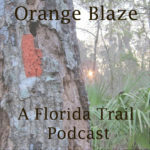 Just wanted to say I’ve been enjoying your blog, esp your adventures on the Florida Trail (which is how I stumbled upon it). I admire your sense of adventure and creative talents. Best of luck! Does prolific also refer to the literal sense of the word?????? Babies in the near future??? Can you send me an e-mail giving me a brief summary of what Pinterest is? I feel like I always hear so much about it through blogs, but I just haven’t had the chance to sit down and check it out. I’d like to know what I’m getting into. I think my word for 2012 will be to “simplify.” I yearn for the simple life we found on the trail and now that we are jumping back into a very busy job and unpacking all our stuff, I’m hoping I can still apply some of what we experienced on the trail to real life. Wishful thinking! !